Cosplayers and larpers are the same! As usual, I'm gonna write as first, what was the motivation to write this post. I made chainmaille for my cosplay of Appolyon - just 30 cm of it, but still, it caused a lot of people to question the type of weaving I used, the types of rings I used and the overall characteristics of the whole maille. And as I like the critique (since it moves me forward in lot of ways) from some point, it started to be kind of annoyning, that I had to describe to each and everone who commented things like that, that I am making a cosplay armor - not reenactment or larp armor, that I do not plan to fight in the maille, and that I wanted to achieve some lightness of it all whilst being true to the character - Photorealism. Follow me on my social sites @datgermia for progress on this cosplay, I am working on it right now! 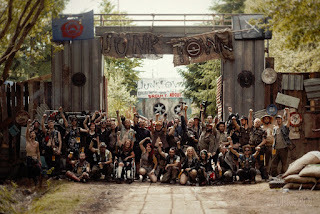 I spoke with my friends, that told me something like: "They are just larpers, the don't know nothing about cosplay..."
I feel like the (historical) larp community was always argueing and fighting on social media with cosplayers community and it is really not necessary - we are the same, guys, and we have to help each other! 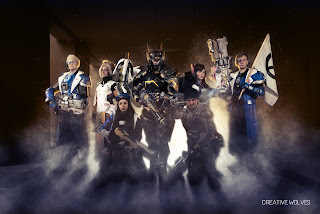 Disclaimer: In this article, I speak as a cosplayer, I am no reaanactor, no larper. 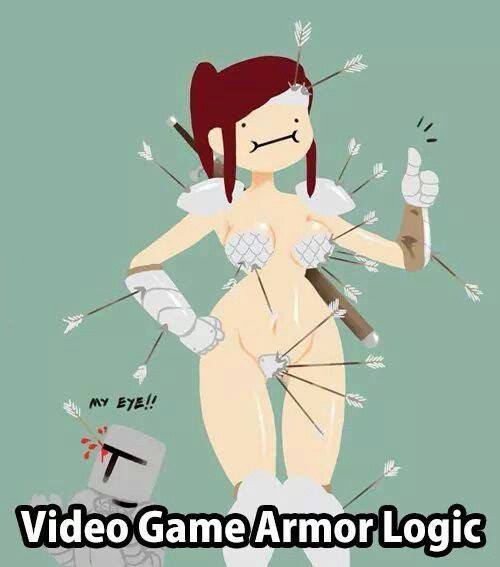 I consider myself armor-enthusiast. So even I'm trying to make cosplay armor, that is not historical and was never meant to be historical, I still admire historical armor, it's function adn look and I always try to learn about it as much as I can. If I say something wrong, it is not intended to offend anyone and feel free to correct me. I just wanted to point out, that our communities do not have to fight each other, that we can behave respectfully and we should not force anyone in making stuff they don't want to. Why are we the same? It's great, that because we both make costumes, we can share knowledge about the costumes we made, what materials did we use and why did we use them. Share what are our plans with that costume and what material is the best for that purpose (larp, reenactor, cosplay). Isn't larp all about roleplay? Cosplayers love it too. Some less, some more, but we are the same in that matter! Btw. 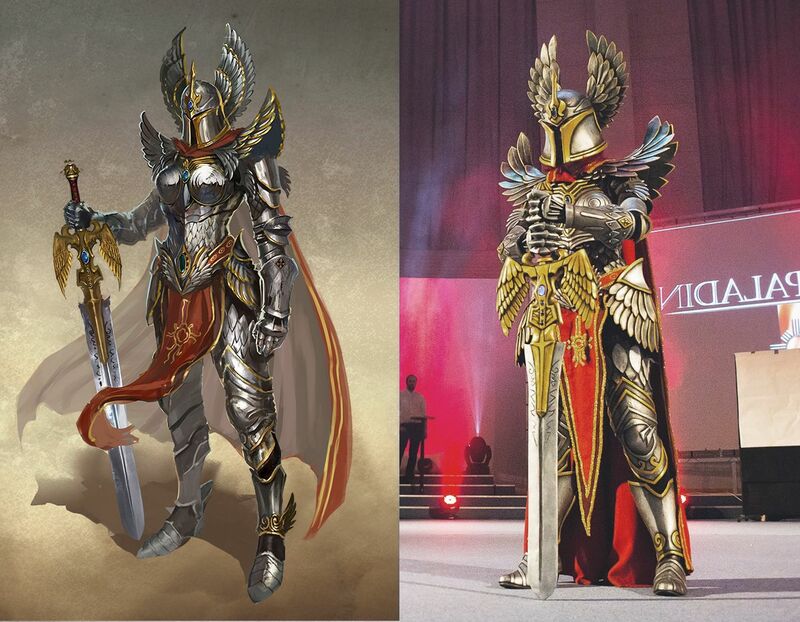 the word cosplay even contains the world roleplay in itself! Loving one community doesn't mean you have to hate others. We are not competing in any way and both our communities can coexist without a problem. Always try to respect people from the other community and their choices even it is not something you like. If you try to join the other community, try to respect others even more and learn from them and about them. Both cosplayers and larpers (and reenactors - I'm not forgetting abotu them, but usually, their community doesn't fight on social sites as much as larpers adn cosplayers) are imitating something. We both are usually not designers with free chosing of materials, colors or look. Cosplayers have to follow the characters they want to bring to real life - their color palette, they try to imitate the look and the feel of the materials they are wearing in game and at the same time make it comfortable to wear (as much as they can/is possible) and epic looking. 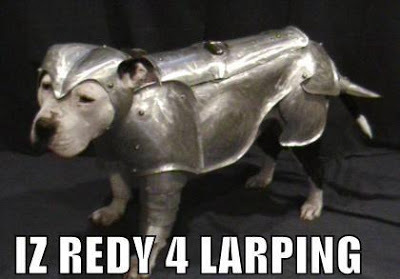 Larpers are trying to imitate the feel of the world they want to imitate and their garment has to fit in their world and has to be "practical" at the same time. If we are talking about historical larpers, they do not usually study a certain character, but a certain time in history - what materials were used for the garment, what colors and how to make the garment durable to withstand several days of rough time on larp. 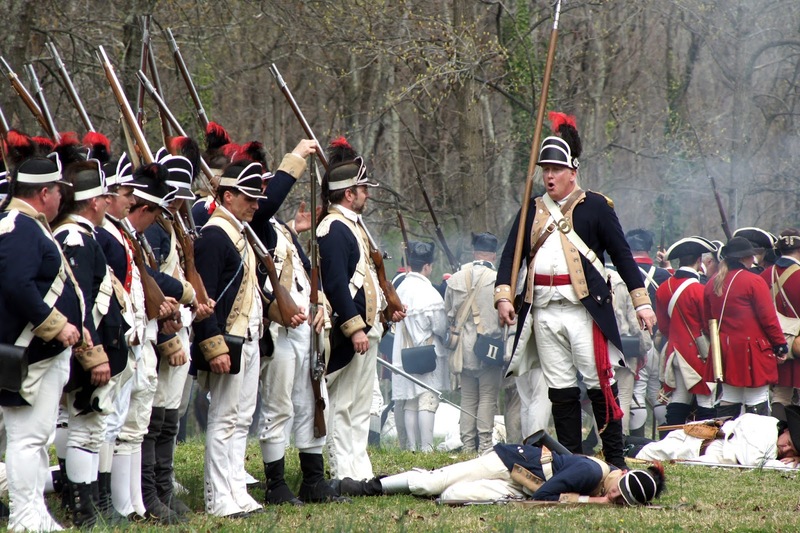 Reenactors has to follow only historically accurate and historically used garments and equipment. They go for practicality and accurancy. No fantasy element is included. Both cosplay and larp worlds can connect in some ways, both can be really different in other ways. What stays is, that we make similar stuff with different approach and the most important thing is mutual respect. Cosplayer makes costume. 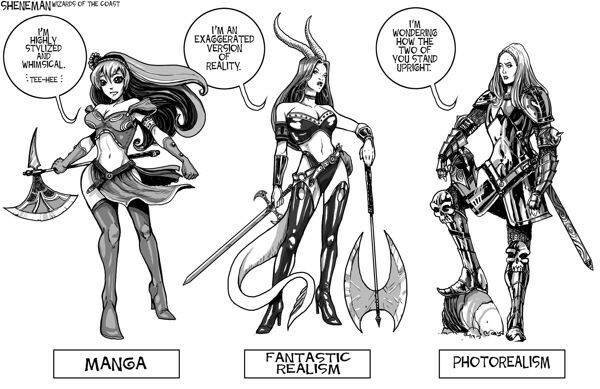 It has to be accurately portrayed certain character or original design in to (maximally) be photorealistic. The material chosen for making the costume is up on the cosplayer, but whatever you choose to make the costume, the material should be portrayed the same as in game/movie or TV-show. Larp costume has to fit in the fantasy world, where larpers spend their time (Postapo, Hobbit, ...) and has to withstand their fights and their lifestyle during their convention. That means they have ot go beyonf photorealism here and practicality shakes hands with look and feel of the costume. Some larpers go more into reenactment and the borders are not very firm there. Reenactors try to portray a historical time. They use historically accurate materials, they try to learn more about history and what was really used in history to make a garment. They try to imitate the historical look as accurate as they can. Sometimes using real historical armor or uniforms. 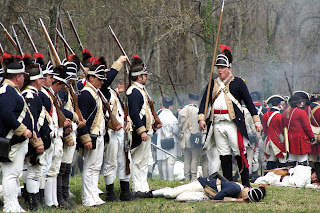 And because reenactment involves even fighting, a lot of reenactors put a big emphasis on practicality, that is actually involved in making historical accurate garment. Some people love historical armor, some people love postapo, some people fantasy, some sci-fi. I love all the things above and I know making an accurate costume in a community is hard. But let the people have freedom with their costume, let them work with their fantasy. If your historical community has some rules, do not apply them on other communities with more fantasy approach. 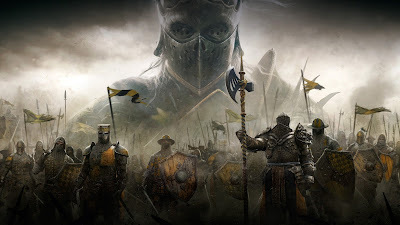 Even a game character can look historical, in fact most of the historical looking games are fantasy games and their armor is usually a mixture of different centuries, different styles and some part are often non-historical at all. Only few games are trying really hard to be as much accurate with armor and garments as they can (for example Kingdom Come: Deliverance). For more about this, I highly recommend video under this text, or two historical channels - Shadiversity and Metatron for getting more knowledge about historical and fantasy armors, arms, garments and buildings. If a material isn't fitting for you and you prefer wearability, do not force others to use that. Other people can prefer durability or other characteristics. Remember the goal of a cosplayer is different than a goal of a larper. Try to think about choices of other people before telling them what is best for them. If you are and experienced cosplayer and you come to larp community, do not tell them what materials they should use to make the costume look better or feel better. Do not try to tell them what is right. As a larper, do not come in cosplay community telling cosplayers, that there is no costume without a proper blacksmithing or that you don't need a wig for your costume, since it is not natural for a woman in 12th century would wear a wig. You only piss people around you and with telling others what to do you would be regarded as really annoying. The good approach either way is to study a community, to learn from it. Why cosplayers/larpers use this material: Is it because they are dumb or because they know what is the best thing for their purpuoses? If you are a really good learner and you stay respectful, you can try to teach others (for example by holding panels, making tutorials) about techniques or ways of your community and let other choose if they want to use them or not. Why are you having issues with this armor with boobplates, but not with this other very unrealistic armor without them - it just looks more historical but it is actually not. Why are you insulting my work put into my unrealistic chainmaille telling me that I should use stronger wire for historical look, but in history, butted chainmaille was used very rarely? Why are you highly regarding leather as authentic material even leather wasn't really used for making armor in history? This article was made with the support of my patreon followers and I'm really greateful to them! Artikel Cosplayers and larpers are the same! ini dipublish oleh germia pada hari neděle 28. ledna 2018. Semoga artikel ini dapat bermanfaat.Terimakasih atas kunjungan Anda silahkan tinggalkan komentar.sudah ada 0 komentar: di postingan Cosplayers and larpers are the same!